Buckingham 1902 Semi Float Body Belt has a 6-ply neoprene impregnated nylon 1 3/4″ waist strap. Buckingham 1958 Semi Float Body Belt has a 5″ wide back pad. Buckingham 1962M Full Float Body Belt is a full float body belt with a 6-ply neoprene impregnated waist nylon. Buckingham 19655M Full Float Body Belt - The 1 3/4″ waist strap is made of 6-ply neoprene impregnated nylon. 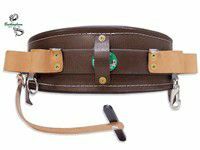 Buckingham 1993F Full Float Body Belt is a full float body belt that has a 5 1/2″ wide pad. Buckingham 1993F Full Float Body Belt is a lightweight full float body belt with an extra wide back support. Buckingham 1994FR Full Float Body Belt is constructed of 1 3/4″ 6-ply neoprene nylon with 9 adjustment holes. Buckingham 20005M Full Float with Backsaver - The back rest by using two straps in the center of the back.